i’ll try to remember always just to have a good time. … yeah. That looks about right. If you’re wondering about that last one, allow me to inform you. The Go! Team is a Brighton-based six-piece that has yet again brought the funky funky jamz with their latest release, Proof of Youth, out on today on Sup Pop Records. While the overall feel of the record is the same as 2004’s Thunder, Lightning, Strike, the sound is richer, more developed, and the frenetic energy of band leader Ian Parton harnessed and redirected into making this album one of the more exciting releases this year. Their sound goes beyond typical indie rock fare – combining Double Dutch jump-rope chant vocals courtesy of female frontwoman Ninja, noise-pop guitar by Sam Dook and multi-instrumentalist Kaori Tsuchida, and driving drum beats served up by their two drummers: Dook and male frontman Ian Parton. The effect is so strong that one cannot just listen to The Go! Team; you have to write a screenplay for a movie that will feature solely their songs as the soundtrack. You have to play hopscotch and then race to the monkey bars. You have to get up and dance around your dorm room while eating fruit snacks when you roommate is away studying. The sound alone is reason enough to recommend this album to anyone, but what seals the deal is the artist collaborations and the track-to-track song strength. 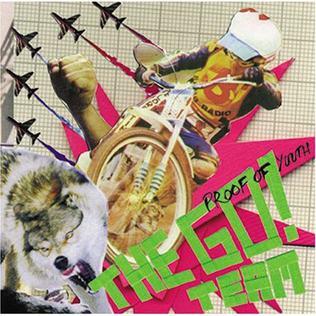 Artists featured on Proof of Youth include Bonde du Role’s Marina Ribatski, Rapper’s Delight Club, and none other than Public Enemy’s Chuck D.
“Flashlight Fight,” featuring Chuck D. is an all out assault – a swarm of cartoon bees that chases you until you jump into a lake and then hovers there above you, waiting. Other strong tracks include the single “Grip Like a Vice,” which claws it’s way out of the speakers demanding to be heard, and album closer “The Wrath of Marcie,” a song that grabs the audience and struts with them into the sunset. While Proof of Youth is perfect as is, I cannot help but fear that when the next album comes that we will see The Go! Team having to bend to create an equally enjoyable album without sounding played out. But for now, I am happy to enjoy their company, and the feelings of childhood happiness that they evoke. Bat for Lashes – Fur & Gold. With the exception of Animal Collective and a scant few others, I am not a big fan of the so-called “Naturalismo” movement in American music. I believe I once said that Joanna Newsom, probably the most recognizable name out of the movement, was the most overrated artist ever, and that for all I care she “can eat doodie.” My friend Laura was quick to point out to me that it is in fact I who “should be eating her bowel movements” and that to do so would “be an honor.” Direct quotes there, people. So, obviously, freak-folk does have some fans on both ends of the musical conversation. Some artists, like The Shivers and Devendra Banhart, embrace the label, while others, like Grizzly Bear, haven’t been so happy with being shoved under the freak-folk umbrella. Similarly, listeners find the genre to be very polarizing – most either love it or hate it, with few moderates. Since no one really seems to know for sure what a freak-folk artist sounds like, many are hasty to slap the label on bands just to see if it sticks. Bands like Sunset Rubdown, Iron and Wine, Sufjan Stevens, and the aforementioned Grizzly Bear have all been, in my opinion, misread by those who think that they are freak-folk. However, I am all for Joanna Newsom, Blonde Redhead, Devendra Banhart, and CocoRosie being called such… they are freaky and they play folk music. Seems fitting enough. What is all this getting at? Enter Natasha Khan, aka Bat for Lashes. She’s a Pakistan-born, English-raised singer-songwriter whose stellar debut album Fur & Gold finally saw its US release on August 31 after being available overseas since 2006. For almost a year now, since I caught an mp3 of opening track “Horse and I” online, I have been following Bat for Lashes, and I have not been disappointed by this album yet – even though it is probably going to be an easy peg for being freak-folk. Khan’s vocals are definitely the focal point of all the tracks, with the backing instruments being mainly piano, guitar, Theremin, and drum machine. Fans of “You Are Free”-era Cat Power will probably enjoy the somewhat weepy “Sad Eyes,” while fans of Bruce Springsteen honestly will probably not really like her cover of “I’m On Fire.” It’s pretty good nonetheless. All in all, Bat for Lashes’ new CD will probably please fans of freak-folk (if this album is anything, it is certainly alternative) and might even draw in a few newcomers to the genre. Since it is her debut album, there will inevitably be weak spots, but Fur & Gold is a very solid effort, and has established Natasha Khan as an artist to watch in the future. It isn’t the greatest album of 2007, but it is undoubtedly a great album of 2007.